The year 2015 started turbulently, with a surprised lifting of the currency peg of the Swiss Franc to the Euro by the Swiss National Bank (SNB). The SNB introduced the peg in September 2011 by putting a floor of 1.20 francs to the euro. In the following 3 years, the central banks’ balance sheet was inflated with billions of Euros, which were bought to defend the peg. As the European Central Bank (ECB) announced its new quantitative easing (QE) program, the SNB decided to remove the peg because it was becoming too expensive to maintain. A new QE program will be implemented by the European Central Bank, starting from March 2015. It is designed to spark positive inflation and economic growth in the Euro-zone. First results are a weakening Euro and rising stock prices. Most government bonds across the Euro-zone climbed to all-time high prices resulting in all-time low yields/returns. In general, the program is designed to buy 60bn Euro worth of government bonds and other credit instruments over the coming 18month. Mr. Draghi kept the option open to modify or extend this program in the future. Just as tensions between Europe and Russia seemed to be decreasing, another tragedy happened in Ukraine. Now talks are planned to increase sanctions, with some speculation about the exclusion of Russia from the international SWIFT payment system. The CEO of VTB, Andrei Kostin, mentioned that this would be tantamount to “war”. At the same time the rating agency S&P downgraded Russia’s sovereign credit status to “junk”. This will put further pressure on Russian finances and its ability to refinance. There could be some political pressure behind the downgrade. Sanctions are hurting the Russian economy and it will take time to adjust away from European integration to a more economic integration with Asia. However, Russia has relatively low debt, sufficient reserves, generates hard currency from exports (such as oil & gas) and could seek refinancing from China. We think that these facts are not properly reflected in the downgrade to “junk”. 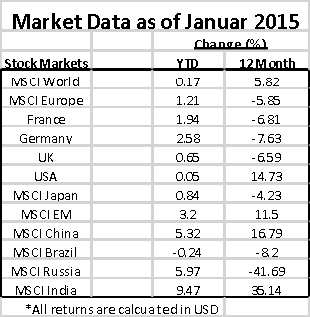 We do not know what will happen in a year or two, but currently we see the default risk of Russia as low. The following data also supports our view on Russia. 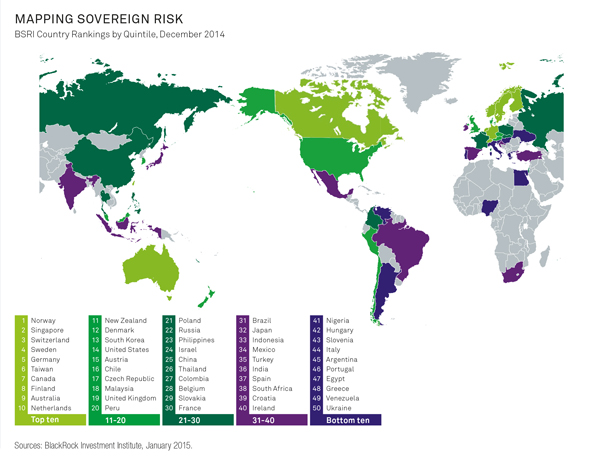 BlackRock Institute’s Sovereign Risk map shows that under BlackRock’s criteria Russia is more creditworthy than countries like China (S&P AA-), Japan (AA-) or France (S&P AA). The US and UK have gained ground in the BlackRock Sovereign Risk Indicator table (BSRI) on the back of strengthening economies, with markets expecting rate hikes in the year ahead. The Eurozone’s BSRI profile tells a story of stagnation in most of the core—and steady gains in the periphery (from a low base). Spain (up six notches), Netherlands (up four) and Italy (up two) were notable gainers. Japan’s BSRI score has held steady despite a mounting debt load. A strong external finance position and government stability partially offset Japan’s poor fiscal health. A sharp fall in oil prices was a key economic trend. There is a correlation between commodity price swings and the BSRI scores of commodities exporters such as Russia. India rose six notches, gaining much ground after the election of reformist Narendra Modi. China fell six notches on rising local government debts. Greece improved but faces a snap election that brings into question its eurozone membership. We are positive on the short-term future of equity markets as central banks will likely stay easy and governments will do everything to keep the economy afloat. Global developments should profit equity markets as money is cheap and bond prices, especially government bonds of developed countries, are high. A rebalance from bonds to stocks, called the great rotation, is likely to happen over the next couple of years. Should money from bond markets flows into equity markets, we could see much higher equity prices than today. Black swan events (events with extremely low occurrence probability) can change the whole investment environment and have adverse effects on global equity markets. However, to build wealth, investing in equities is one of the best ways as historic equity returns show an outperformance over most other asset classes. – European equities with currency hedging, Indian equities and adding exposure to gold. DISCLAIMER: Comments/charts do not necessarily imply their suitability for individual portfolios or situations in respect of which further advice should be sought. Shoreline is not responsible for the content of external internet sites. information used in this newsletter has been prepared from a wide variety of sources that Shoreline, to the best of its knowledge and belief, considers accurate. You should make your own enquiries about the investments and we strongly suggest you seek advice before acting upon any recommendation. The opinions expressed in this report are those held by the authors at the time of going to print. The views expressed herein are not to be taken as advice or recommendation to sell or buy shares. This material should not be relied on as including sufficient information to support an investment decision. Any forecasts or opinions expressed are Shoreline’s own at the date of this document and may be subject to change.